“I am groot”. Repeating those three words for a week as the Stan Lee-created tree-humanoid in Guardians of the Galaxy may well have been the easiest acting role Vin Diesel's ever had. Never mind that he apparently had a 50 page script to help provide context for each recital. On face value, it’s a pretty sweet gig. 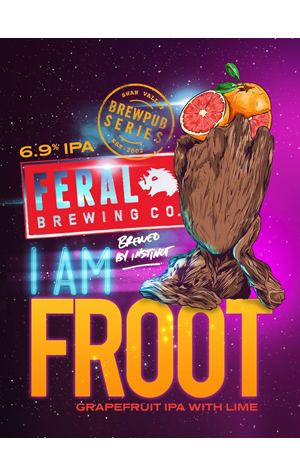 And so is the new grapefruit IPA from Feral that puns upon the name of the anthropomorphic tree. The grapefruit isn't the only addition – there's lime too – and their impact is pronounced in the aroma and presents with more of a candied nature to taste, where the fruitiness is joined by pine. The viscous mouthfeel takes you on a ride through bitter and sweet before finally arriving at a herbal and grassy bitterness.